These larvae are from a rookery in a culture that I'm raising for a study. and I had those black larvae eating the surface of G. lucidum, but than, they started to bore into the G. lucidum so I left it their. After few month, I hatched the G. lucidum and all I found were white larvae. Now I have about 10~12 of them with many eggs and few black and white larvae so I am going to see if the black larvae turns into white. I'll be watching for results! this has been one of several vexing beetle mysteries ever since it was posted. between your larvae and Tom Murray's. Have you confirmed these are B.cornutus? Now to see what Tom says about his. FYI, the larvae in this photo are from Floridian stock and were raised exclusively on a diet of Ganoderma lucidum. I have also had specimens shipped to me from Pennsylvania, where they were raised on Ganoderma applanatum. The Pennsylvanian larvae looked like Tom's photo. 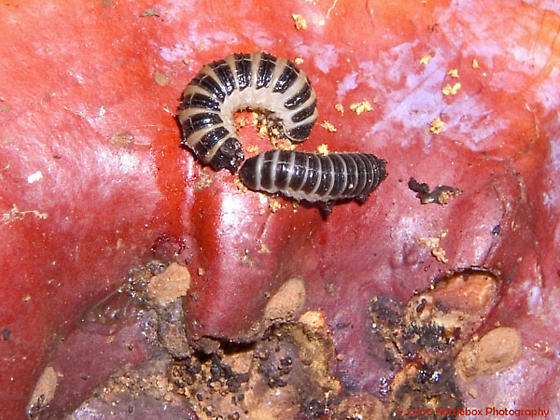 Both the Pennsylvania and Florida specimens have been raised to adulthood in a lab, so the identity of both larvae has been confirmed in a controlled environment. I can't say why there might be larvae with two different forms. It might be the difference in diet, or it could be an ongoing divergence between the populations. B. cornutus isn't exactly a long-distance migrator, and according to what I've read about them from previous studies (Whitlock 1992, e.g. ), it wouldn't be surprising to find distant populations to have large genetic variations. As fascinating as that it, my own study is restricted to the insect's relationship with G. lucidum and G. tsugae, so I won't be the person to confirm whether this is happening. There's a good opportunity for publication for somebody else here, though, I'm sure. How on earth could these larvae be so different? Tom and I have radically different larvae yielding the same adult species for another tenebrionid, Cent*ronopus calc*aratus, but they are geographically close in our case. I suspect mine is erroneous -- a mixup of larvae -- but what if both are correct? Wow!